“Have you been to Namak yet?” That’s the question on everyone’s lips in the capital this month. 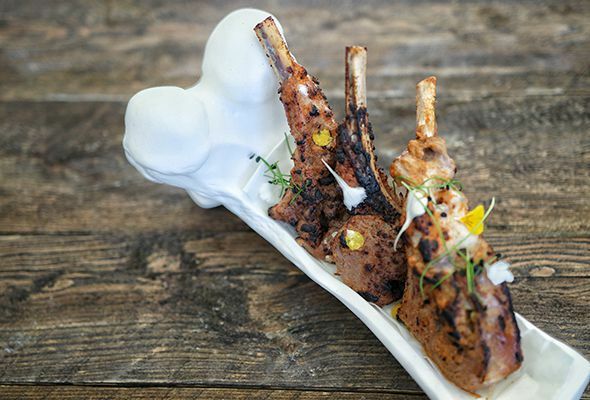 The brainchild of celebrity Indian chef Kunal Kapur, Namak is one of the most exciting restaurant openings so far this year. So we signed up for a special tasting session to check it out. Things got off to a quirky start with a novel welcome drink: a cold concoction called kalanamak, which blended lemon, toasted cumin and chaat masala creating a curious, warming sensation in our mouths and tummies, while the mini-kulcha amuse-bouche of green peas and cheddar made our mouths water. A smoked chicken soup starter was presented under a smoke-filled globe. Laced with hickory and cinnamon, it smelled like a campfire. It’s good but forgettable – ultimately tender pieces of chicken in a warm broth. 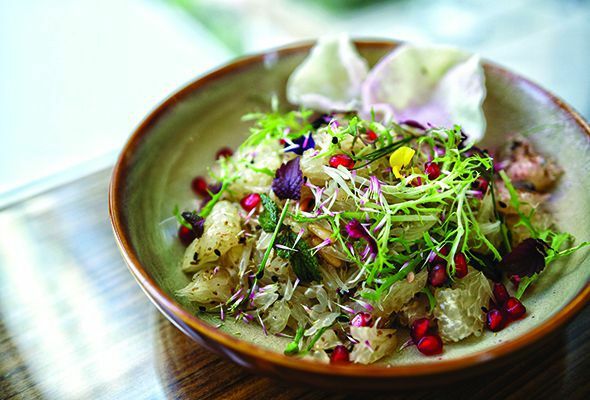 We couldn’t get enough of the Pomelo salad with black namak (Dhs50), however, where the contrast of roasted cumin with a fruity pop of pomelo and pomegranate was delicious. Another winning dish was the tacos (Dhs50): savory chicken tikka mixed with sweet apricot chutney, topped with crispy potato strings, and stuffed into a soft Tibetan tingmo bun. The lamb chops starter (Dhs90/Dhs145), aptly labelled on the menu as fall-off-the-bone, arrived at the table very carefully, with our server handling the tandoori chops as though they were ancient artefacts. If you’re not a fan of traditional Indian desserts, try the apple cinnamon shrikhand (Dh50) – a cinnamon flavoured yoghurt, which tasted just like rich and thick cheesecake. Readers, here’s a tip: don’t just order one starter, main and dessert and be done with it. Instead, go hungry and take a food journey through Namak’s unique offerings. You’ll be glad you did.